THURROCK Council is flying the rainbow flag at the Civic Offices to celebrate Essex Pride. The flag raising ceremony, which took place on Friday 15 June, brought together Cllr Barbara Rice, Mayor of Thurrock, residents and members of Thurrock Council staff, including the Lesbian, Gay, Bisexual and Transgender (LGBT+) Network. 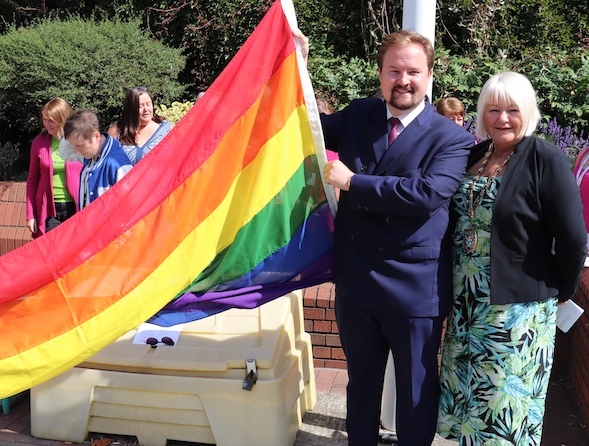 Following an inspirational speech by the Mayor of Thurrock, the rainbow flag was raised by Cllr James Halden, Portfolio Holder for Education and Health, during a special performance from the Thurrock Council employee choir, led by Daryl Branch from Creative Blast. Essex Pride is an annual event celebrating LGBT+ life, aiming to inspire people to embrace equality and come together to celebrate diversity. Cllr Barbara Rice, who attended the event, said: “I am very honoured to be here today as we raise the rainbow flag in Thurrock. “Thurrock Council proudly supports the LGBT+ community and the work that they do to champion inclusivity and equality.